Unnatural movement and excessive motion of the vertebral bodies within the lumbar spine (lower back) in relation to one another is considered lumbar spine instability. When global damage occurs to the two main stabilizing structures that make up the spine (disc and both facets), instability can result. Instability in this region will make a patient feel as if the areas within the lower spine are moving at greater motions than what the bone and muscle can tolerate. The cause of lumbar spine instability can be the result of a degenerative process (such as wear and tear arthritis), as well as a tumor, a previous injury or a congenital condition. Patients with lumbar spine instability typically have reoccurring episodes of sharp immediate lower back pain and the loss of mobility. It may seem like a paradox that excessive motion leads to decreased mobility, but in the condition of lumbar spine instability this is generally true. A patient who is experiencing this type of excessive motion usually tries to reduce the painful vertebral slip. He or she will do this by contracting the muscles of the back and belly and reducing the amount of bending he or she does. This reduces the range of motion of the lumbar spine. Are you suffering from symptoms of lumbar spine instability? Symptoms of instability within the lower spine include lower back pain accompanied with an on-going unstable sensation within the region. Many patients find it difficult to rotate their mid-section. Muscle spasms are also a common occurrence for patients experiencing instability. A painful clunk can occur with motion and an unprepared patient who steps off a too high curb will get an electrical jolt to their back. Non-surgical treatments are typically enough to control the symptoms of lumbar spine instability. Non-steroidal, anti-inflammatory medication along with physical therapy and prescribed exercises typically work well. A core strengthening program and neutral spine program are important. If these non-surgical remedies do not work, then a surgery involving stabilization and fusion will most likely be the next course of treatment for lumbar spine instability. Please contact the Vail, Aspen, Denver and Grand Junction, Colorado area office of Dr. Donald Corenman, back doctor and spine specialist, for additional information on lumbar spine instability. 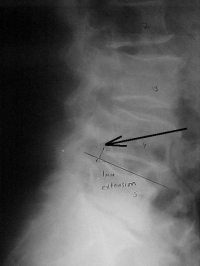 (Click to Enlarge Image) This is an extension (bending backwards) film of a patient with an unstable L4-5 segment. The instability is from a degenerative spondylolysthesis. You can see from the dark arrow that there is a one mm slip of L4 on L5. (Click to Enlarge Image) This is a flexion (bending forward) film of the same patient. You can see that the slip of one mm has advanced to ten mm because of the instability.